No matter the size, we always build our booths with your grand vision in mind. At this year’s National Retail Federation (NRF) show, we helped our clients achieve many great successes in a variety of different booth sizes and styles. 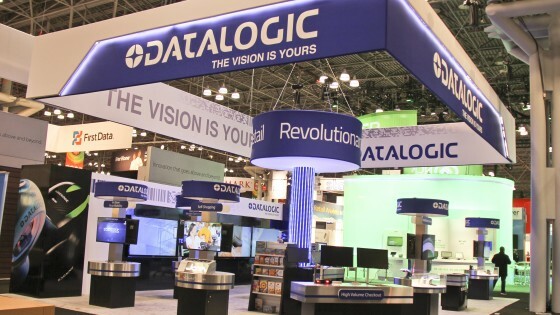 One of our notable clients is Datalogic, a global leader in Automatic Data Capture who has been working with DesignCentrix for many years. Dennis Fitzgerald, President and Founder of DesignCentrix, has been working with them from the beginning. This year, we created a stunning 30’ x 40’ space to incorporate their four new product lines. Featured in the booth was a tiled 1 x 4 video wall made up of 80” monitors, and a custom 30’ x 40’ edgelit hanging sign drew customers in from above. Their grand display showcased their revolutionary retail solutions to give retailers an enhanced shopping experience. We had to think outside of the box to create a unique booth for Zebra Technologies, a top provider of real-time visibility into organizations’ assets, people, and transactions. Instead of a traditional booth, Zebra wanted to have four separate meeting rooms setup within their 30’ x 30’ space. They recently acquired Motorola Mobility and wanted to use the rooms to create a sense of privacy when discussing the merger with potential and existing clients. Whether you’re a large corporation or a small start-up, DesignCentrix can turn your dream into a reality. Contact us for your next trade show booth, and we’ll bring your vision to life.